The new Honda diesel 118 Bhp i-DTEC engine is one of the first units to be officially tested under the new Worldwide Harmonised Light Vehicle Test Procedure (WLTP) fuel consumption and emissions cycle, which comes into force this year in preference over the current New European Driving Cycle (NEDC) standard, according to Honda. The engine is also one of the first to be officially tested through the Real Driving Emission (RDE) procedure to validate NOx and particulate emission levels. The efficiency enhancements for the new Honda Civic 1.6 i-DTEC result in fuel economy and CO2 emissions starting from 76.3 mpg (3.7 l/100 km) and 99g/km under the WLTP cycle – according to Honda’s internal data. 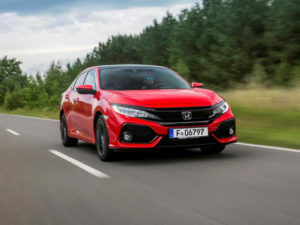 Honda states performance figures for the 1.6 i-DTEC engine as 118 Bhp (120 PS) at 4,000 rpm and 221 lb.ft (300 Nm) of torque at 2,000 rpm, powering the Civic from zero to 62 mph (100 km/h) in 10.4 seconds. The revised diesel engine will be manufactured in the UK at Honda’s Swindon facility and be available in both the four-door and five-door variants of the 10th generation Civic. In mid-2018, Honda has confirmed the Civic will be available with an optional nine-speed automatic transmission. Honda says improvements to the diesel 1.6 i-DTEC include a reduction in cylinder friction, thanks to pistons made from highly durable chromium-molybdebnum steel alloy, as well as ‘super plateau honing’ of the bores to enable smoother piston movement. The 1,597cc engine uses the same advanced Bosch fuel injection system as before, and features a small, high-efficiency turbocharger, low-pressure EGR (exhaust gas recirculation) system and a high-intake flow, high-swirl cylinder head port. A high-strength, lightweight slender crankshaft and all-aluminium, open-deck, high-pressure, die-cast engine block minimise the engine’s weight. For the new i-DTEC, additional cast ribs have been added to the cylinder block to increase structural rigidity and, consequently, improve the management of noise, vibration and harshness. The diesel powertrain has a new NOx Storage Converter (NSC) system with larger catalysts and a higher content of noble metals (silver, platinum and neodymium) that store nitrogen oxide gas until the regeneration cycle. A soot sensor accurately detects when the regeneration cycle is required, extending exhaust component durability.